An extremely scarce early edition of the first bartenders' guide to include cocktail recipes. In addition to listings of recipes for Punches, Sours, Slings, Cobblers, Shrubs, Toddies, Flips, and a variety of other types of mixed drinks were 10 recipes for drinks referred to as "Cocktails". A key ingredient which differentiated "cocktails" from other drinks in this compendium was the use of bitters as an ingredient, although it is not used in many modern cocktail recipes. By the great Professor Jerry Thomas, referred to as ‘The Best Bartender of the Past’ by Harry Craddock in the Savoy Cocktail Book. Contains 236 recipes by Jerry Thomas and 463 recipes by Schultz, with in text illustration. Publishers advertisements to front and rear and catalogue to rear. One page announcing the publication of ‘The Bar-Tender's Guide And Bon Vivant’s Companion’ which was the new title used from 1864 onwards. 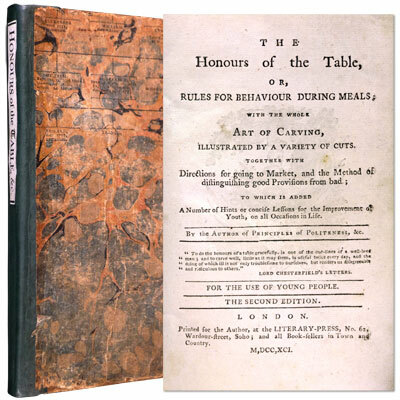 Of all the graceful accomplishments, and of every branch of polite education, it has long been admitted, that a gentleman and a lady never shew themselves to more advantage, than in acquitting themselves well in the honours of their table; that is to say, in serving their guests and treating their friends agreeable to their rank and situation in life. A scarce copy of this wonderful little work, first published in 1788, in the original marbled paper boards and illustrated with twenty-seven woodcuts by John Bewick, including wood-engraved Trusler coat-of-arms. Bound with the complete 12 page ‘List of Books by the Rev. Dr, Trusler, At the Literary-Press, No. 62, Wardour Street, Soho. 1792’’. Reverend Trusler was a prolific author whose eclectic output included everything from tips on gardening to commentaries on Hogarth engravings. A rare, important and oft quoted work, in particular in relation to the history of Porter. This second edition, which was published the same year as the first edition, has been enlarged, revised and additions made. With tables including one folding [opposite pages 84 and 85]. In 1951, John Van Druten crafted the award winning Broadway play ‘I Am A Camera’, from Isherwood’s semi-autobiographical short story ‘Goodbye to Berlin’ in which William Prince plays the part of Christopher Isherwood, and Julie Harris plays ‘Sally Bowles’. The legendary Broadway musical producer Harold Prince acquired the rights to Van Druten’s play and it’s source material by Isherwood, which John Masteroff rewrote for the award winning musical ‘Cabaret’, first performed on 20th November 1966, and continuously revived, most recently by Sam Mendes in 2013. Both works contain black and white photographs of the original performances and sets. ‘I am a camera with its shutter open, quite passive, recording, not thinking’. An incredibly rare collection of nearly 300 original illustrated letterpress dinner invitations from Le Bon Bock society, whose soirees on the second Tuesday of each month in near Montmartre were frequented by Paris’ most flamboyant and original writers and artists of the La Belle Époque. The artists competed to have their work used for the next invitation, and together with their work each invitation provides an account of the previous dinners activities, beginning with opening speeches, notices and announcements, and then other activities, which usually include poems, prose, texts, songs, instrumental pieces. The invitations are dated from April 7th 1886 to October 5th 1906, with the first thirty or so addressed to Monsieur Régnier, one of the founders of the association. Individually rare, a collection of this size and association provides one of the most important associations of the Belle Époque in Paris. Inspired by Edouard Manet’s painting Le Bon Bock (The Good Pint), and the democratic, nationalistic ideals that it symbolised, Emile Bellot (the printmaker and model for Manet’s beer drinker) established the Bon Bock Society in 1875. Consisting mainly of artists, writers and performers, the society sought to re-define France’s national spirit by delving into the country’s cultural past. The inseparable ideals of freedom and humour within their community created opportunities for artistic experimentation; the Bon Bockers and their carefree attitude would go on to inspire generations of Montmartre natives for years to come. A magnificent set of the large deluxe vellum editions. Translated from the German into English by Margaret Armour.